Hollybeary Creations : Friday Mashup #153 Looks like Mardi Gras! Friday Mashup #153 Looks like Mardi Gras! 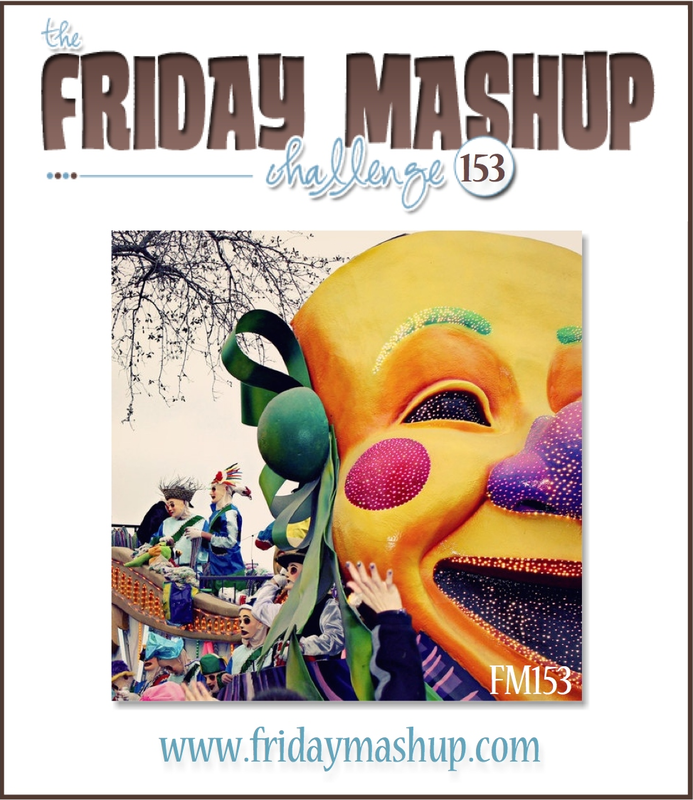 It's time for a fun new challenge at the Friday Mashup and it's looking like Mardi Gras over there. Sara's our hostess and she has a fun Color challenge for us.. We're using Daffodil Delight, Wild Wasabi & Perfect Plum. The Mashup is to create a watercolor effect with your Aqua Painter or Blender pen. I'm having a ton of fun created Watercolor backgrounds these days.. I used my Aqua painter and inks in the challenge colors to create my background on a piece of watercolor paper and then I spritzed it with some Vanilla Shimmer. I created a Daffodil Delight card base and added a layer of Wild Wasabi as a mat for the Watercolor panel. Then I die cut 2 balloons ( Non SU product), one in Wild Wasabi & Pale Plum DSP. 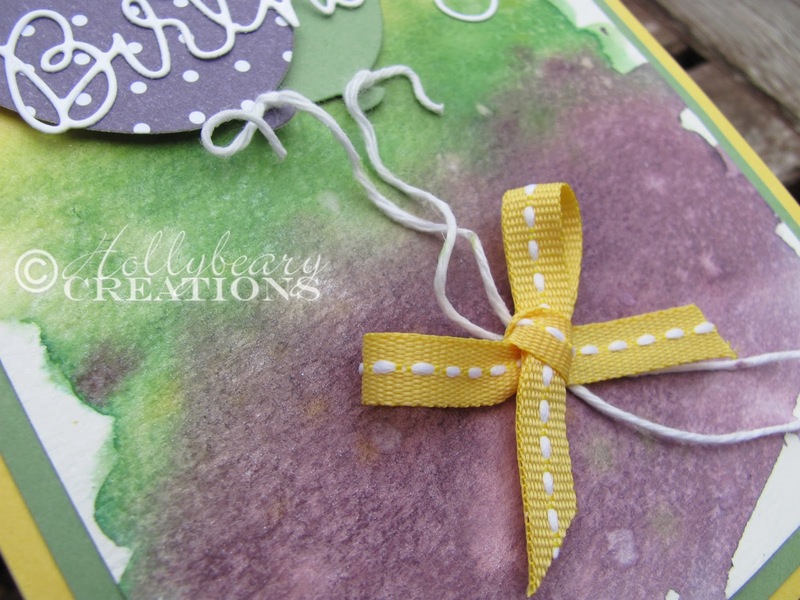 Then I added some White Baker's twine and a bow made from a piece of Stitched Daffodil Delight ribbon. I coated the Baker's twine with some crystal effects so I could twist it and have it keep it's shape. I die cut the Happy Birthday Sentiment (Non SU) from some Whisper White card stock and adhered it to the Balloons. Head over to the Friday Mashup Challenge blog and see what the other Design Team members created with this fun color combo! The challenge is open until Wednesday @ 6pm EST... we hope you will join us! This is a great way to do a color challenge! I think those are the hardest. :-) Cute card - love the greeting in white. I love the background you created with the colors and watercoloring technique. Beautiful card! 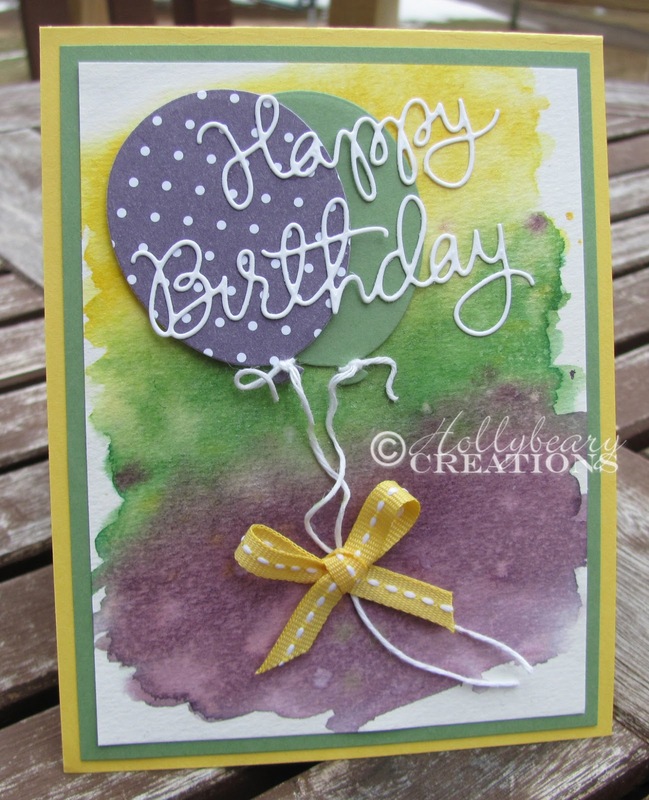 Holly, I love how your card turned out using this week's colors, and your water coloring is fabulous! I love how the colors blended together. Such a cute birthday card! Oh, I like your watercolor effect with the background. Such a happy card!